Hi Everyone and Happy World Card Making Day! Scrappers and card makers all around the world, are getting crafty today. 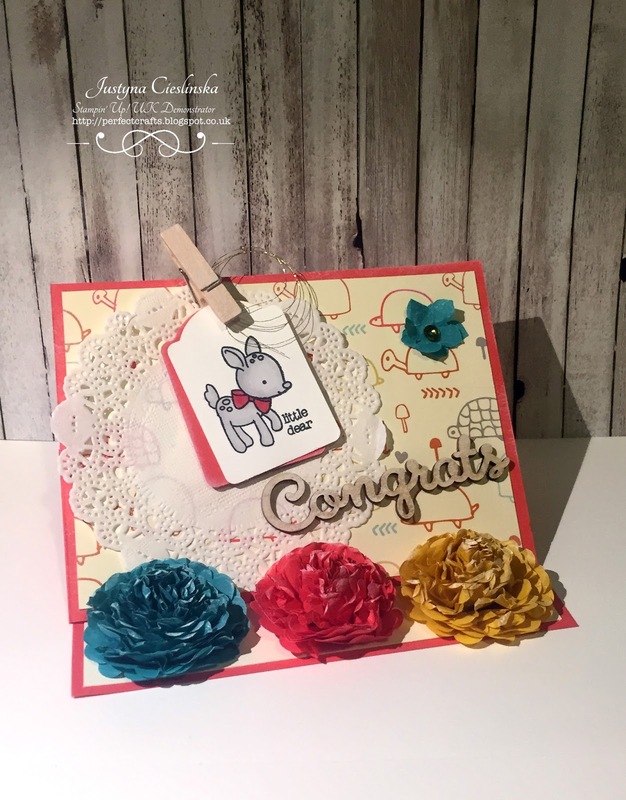 My card for today is a New Baby Easel Card. I used Made with Love Stamp Set and Sweet Li’l Things Designer Series Paper. I created the flowers using Cherry on Top Cotton Paper Assortment and a 1-3/4 Scallop Circle Punch. I added some Whisper White Ink to all embellishments. [PL] Witam, dzisiaj jest Światowy Dzień Kartkowania/ World Card Making Day. Ja przygotowałam kartkę z okazji Narodzin Dziecka. Użyłam stempla z kolekcji Made with Love oraz papieru z kolekcji Sweet Li’l Things. Kwiatki zrobilam używając papieru Cherry on Top Cotton Paper Assortment oraz punchera 1-3/4 Scallop Circle.